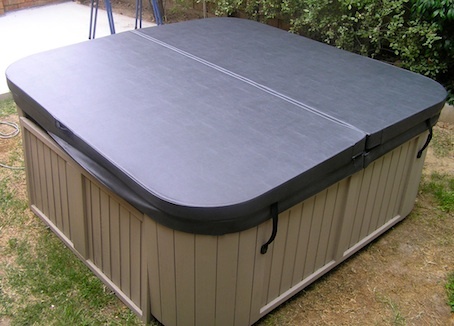 If you have elected to have locking straps included with your spa cover, then you will need to fit them onto the spa surrounds once the cover is in place. 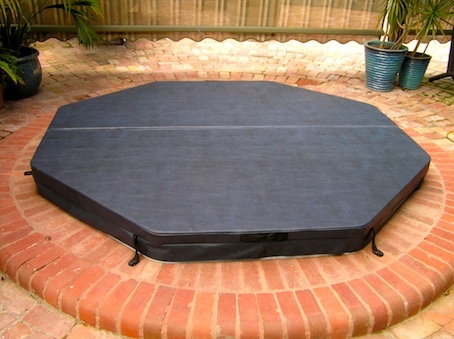 How you do that depends upon whether your spa is portable or in-ground and what type of surface surrounds your spa. Here are the options and information on how to do it. 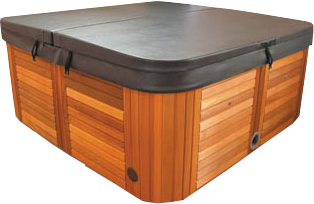 The photo below shows a portable spa and cover with the locks fitted onto the wooden panels encasing the spa. 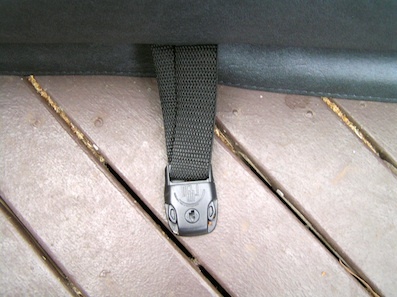 Once you put your spa cover on for the first time, allow the lock straps to dangle over the edge. Clip the female clips ( found in the separate lock pack ) onto the male clips at the end of the straps and then place the whole lock against the wooden side of the spa in the exact location that you want it to be fitted. Important: Always allow a little bit of slack in the strap. Do not install the locking straps too tightly. When you are happy with the lock location, pinch out the male clip and then either screw ( self tap ) the screws directly through screw-holes in the plastic lock or use a 7/64" drill bit to drill the two holes. You may even choose to use a pencil to mark the two hole locations, remove the lock and then drill the two holes. Whatever method you choose, it's very intuitive and not at all difficult. If you chose to pre-drill the holes, then it's now simply a matter of attaching the female clip to the wood by screwing the stainless steel screws through the holes in the plastic clip. If you chose to self tap the screws in, then that's all that's required. Clip the male clip in and repeat the process for the other lock straps. There should be two black plastic keys included with the lock pack. If you require increased spa safety, then use these keys to lock the clips. They are all keyed alike, so contact us if you ever need a replacement. 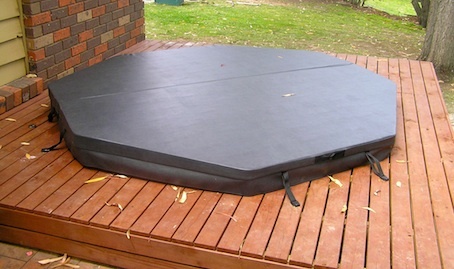 The photo below shows an in-ground spa and cover with the locks fitted onto the wooden decking surrounding the spa. 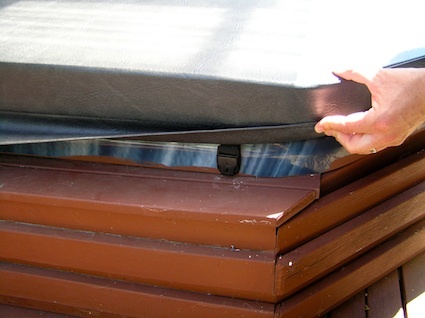 Once you put your spa cover on for the first time, allow the lock straps to dangle over onto the decking. 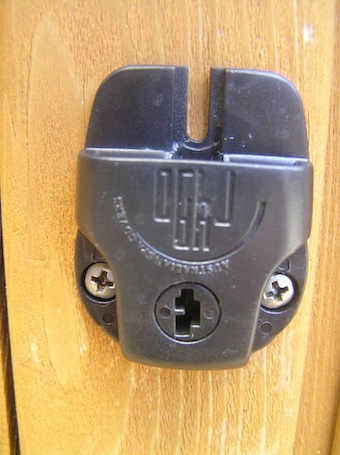 Clip the female clips ( found in the separate lock pack ) onto the male clips at the end of the straps and then place the whole lock on the decking in the exact location that you want it to be fitted. When you are happy with the lock location, pinch out the male clip and then drill directly through the two screw-holes in the plastic lock using a 7/64" drill bit. Alternatively, you may elect to use a pencil to mark the two hole locations, remove the lock and then drill the two holes. Self tapping the screws in is probably not an option ( as it is when installing onto the sides of a portable spa with its soft wood ). The wood used for your decking is probably too tough. If you chose to pre-drill the holes, then it's now simply a matter of attaching the female clip to the decking by screwing the stainless steel screws through the holes in the plastic clip. Clip the male section in and repeat the process for the other lock straps. The photo below shows an in-ground spa and cover with the locks fitted onto the surrounding bricks. 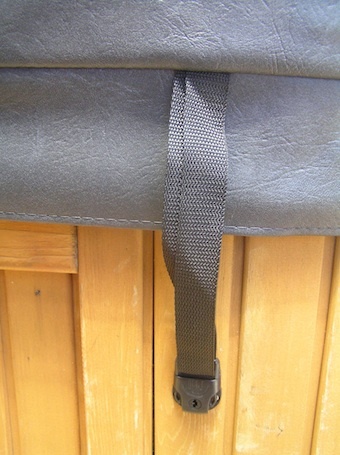 Once you put your spa cover on for the first time, allow the lock straps to dangle over onto the brick. 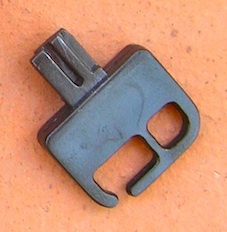 Clip the female locks ( found in the separate lock pack ) onto the male clips at the end of the straps and then place the whole lock on the brick, concrete or bluestone in the exact location that you want it to be fitted. 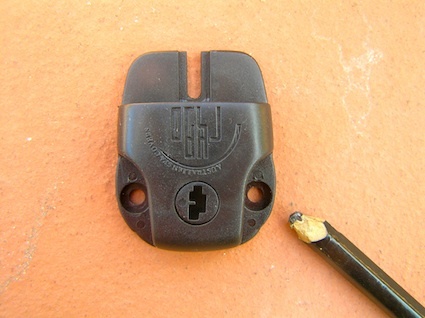 When you are happy with the lock location, pinch out the male clip and then use a pencil to mark the two drill holes ( directly through the two screw-holes in the plastic lock ). You will then move the female lock to one side and then drill the two holes using a hammer drill and a 5 mm drill bit. You will now need to hammer 5 mm raw plug into the two drill holes. Two drill holes with raw plug hammered in. Now it's simply a matter of attaching the female clip to the brick or concrete by screwing the stainless steel screws through the holes in the plastic clip and into the raw plug. Clip the male section in and repeat the process for the other lock straps. The photo at right shows a spa and cover with the locks fitted directly onto the spa. This installation method is considered last resort. It should really only be done when there is no other alternative location for the locks to be fitted. An example would be an outdoor spa installed in a garden area with no wood, brick or concrete around it. Please note: When locking clips need to be fitted onto the spa itself, the locking straps need to be short ( around 6 - 8 cm long, including the male clip ) and sewn under the skirt ( instead of outside the skirt, as it is for all other installations ). When the cover is on and the locks clipped in place, you won't be able to see the locks ( they are hidden under the cover skirt ). This means that any reasonably strong adult attempting to remove the cover without realizing that there are clips, could potentially tear them out of the vinyl. Once you put your spa cover on for the first time, reach under the skirt and make sure the short lock straps, with the male clip attached, are able to hang over the lip. 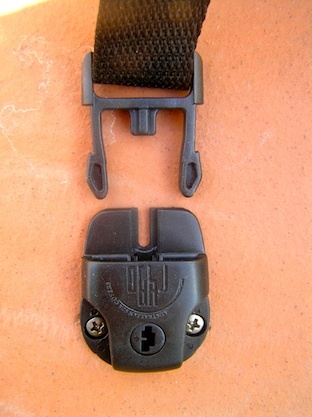 Clip the female locks ( found in the separate lock pack ) onto the male clips at the end of the straps and then place the whole lock on the vertical lip of the spa in the exact location that you want it to be fitted. When you are happy with the lock location, pinch out the male clip and then drill holes directly through the two holes in the female clip and into the acrylic lip of the spa. Use a 7/64" wood drill bit. The acrylic will heat up and spiral out from the bit in long twisted pieces. 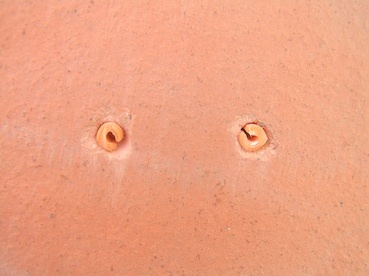 It may take up to 30 seconds to drill each hole. Now it's simply a matter of attaching the female clip to the spa lip by screwing the stainless steel screws through the holes in the plastic clip and into the spa. Clip the male section in and repeat the process for the other lock straps.